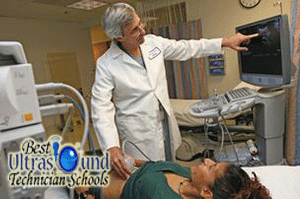 As of 2014, Sanford-Brown is the only institution in Texas's largest city (Houston) to have an sonography tech training program accredited by the Commission of Accreditation of Allied Health Education Programs (CAAHEP). A national education provider with almost 40 locations throughout the United States, Sanford-Brown has one in Houston aptly named SBC-Houston. It is one of three Sanford-Brown campuses in Texas; the others are in Dallas and San Antonio. Overall Texas has 16 sonography techs accredited by the CAAHEP. Students receiving sonography education in Houston enroll in Sanford-Brown's Associate of Applied Science Degree Program in Diagnostic Medical Sonography. The curriculum is designed to train students for two years as they acquire the skills necessary for careers as ultrasound technicians in hospitals and private clinics. Courses are in subject areas such as medical imaging, sonographic patterns of organs, obstetrics-gynecology (OB/GYN), basic patient care, survey protocol, and vascular ultrasound. There is also a laboratory procedure component to give the students some hands-on experience. Overall, students are trained to be competent in the cognitive (knowledge), psychomotor (skills), and affective (behavior) learning domains of sonography. Upon graduation, aspiring sonography technician are expected to be competent in performing diagnostic ultrasound examinations of the abdomen, pelvis, and superficial structures, among other areas of medical imaging. Diagnostic medical sonographers in the Houston area made a median annual salary of $65,840, or $31.66 per hour, in 2012, according to a report by the U.S. Bureau of Labor Statistics (BLS). This figure is slightly higher than the one for the state of Texas, which is $64,300 ($30.93 per hour). The bottom 10 percent of Texan earners in the ultrasound technician field made $45,200 ($21.75 per hour) in 2012; the top 10 percent made $86,900 ($41.78 per hour). The Houston metro area has the fourth-largest level of employment of diagnostic medical sonographers in the country, with 1,130 people in 2012; that constitutes 32 percent of the sonographers in Texas. The BLS expects a 52 percent increase in employment for the entire state, thus increasing the number of professionals to 5,410.